$15.00 per person includes tax and gratuity. Downtown Wilmington and history go hand-in-hand which is why the Springbrook Farms Horse-drawn Tour seems to fit right into the local scene. The tour allows you to sit back and soak up the local culture, legends, and history with the clip-clop sound of horse hooves in the not-so-distant background. Springbrook Farms Horsedrawn Tours have been heralded by tour goers for using rescued Percheron draft horses – one of the most important aspects of the tour’s philosophy. The tour company was recently voted as the “Best Tour” in Wilmington by the local Encore Magazine and was named the #1 tour by Southern Living Magazine. 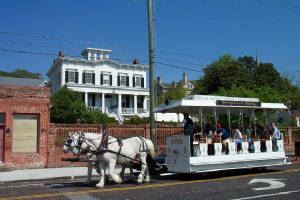 The carriage tours wind through the waterfront of Wilmington, the historic homes and mansions on the outskirts of downtown, and the regal brick buildings that line the downtown streets. Springbrook Farms Horse-drawn Tours provides a perfect introduction for your weekend in Wilmington. As the horses pull the trolley on the return to Embassy Suites, you may also hop off to spend the rest of the morning exploring this unique and interesting waterfront city on your own. © Flying Physicians Association, Inc. All rights reserved.